Welcome, one and all, to Easter Weekend 2014! The weather here has been much more spring-like this week, which has been wonderful. The trees are all budding, daffs cover the grass verges and gardens are beginning to bloom. It won’t be long until the bluebells fill the hillsides! Yesterday, we went for a lovely, sunny run. We ran along the harbour, and it was fantastic! We clocked in five miles, which was our scheduled Hal Higdon training distance. And, we saw our first Easter bunny! There are usually a lot of rabbits hopping around by the harbour, but this year I seem to have missed them all – until yesterday. This cheeky chappy was running quite happily in front of us, then hopped onto a garden wall, and sat in the garden watching us run past. Do you have time off this weekend? Any plans? Have you seen any Easter bunnies on your run? I wasn’t running, but sitting in Starbucks on Lothian Road in Edinburgh today, when a white rabbit walked past wearing white gloves. Ha ha! Only in Edinburgh! Oh, of course! Happy Easter! 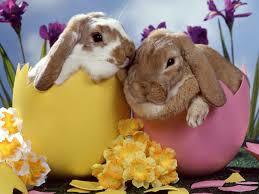 Awww, what cute bunnies!!! I love bunnies!! I’ve seen some on my runs!! I’m so glad you had a great run, too!! You’re awesome!! I have some fun plans for the weekend!! XOXO!!! Haha, very nice! I see like 50 bunnies each time I run. They’re everywhere here. Sometimes I startle them when I come around a corner and they start fleeing. Sometimes they flee along side of me until they get their bearings. I swear they are trying to show me up by running at bunny speed though! Or hopping at bunny speed? No bunnies :(. I did see a raccoon once – they are not so cute. Oh, no- definitely not as cute! I’ve got a long weekend (four days off work in a row!) and I have every intention to spend it run run running. The ultra is 10 weeks away and I’m going to get in as many trail miles as I can 😀 How’s married life treating you?